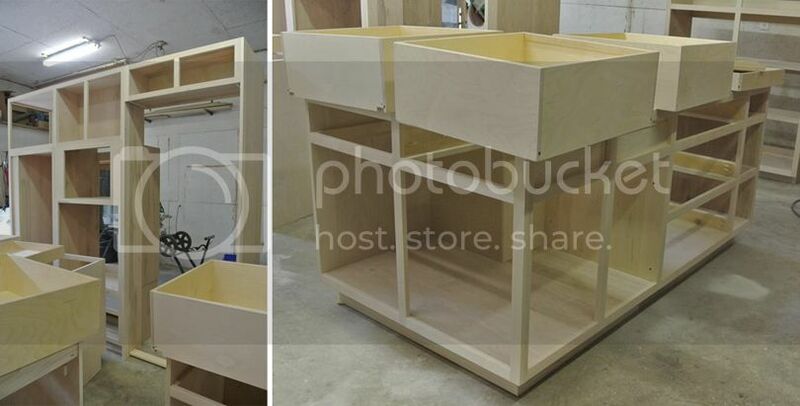 Remember those naked kitchen cabinets in our builder's workshop? Well, they are now stained and inside the house! Last Monday, Greg was out at the house working on the lawn, and texted me to tell me that our builder brought the cabinets over. 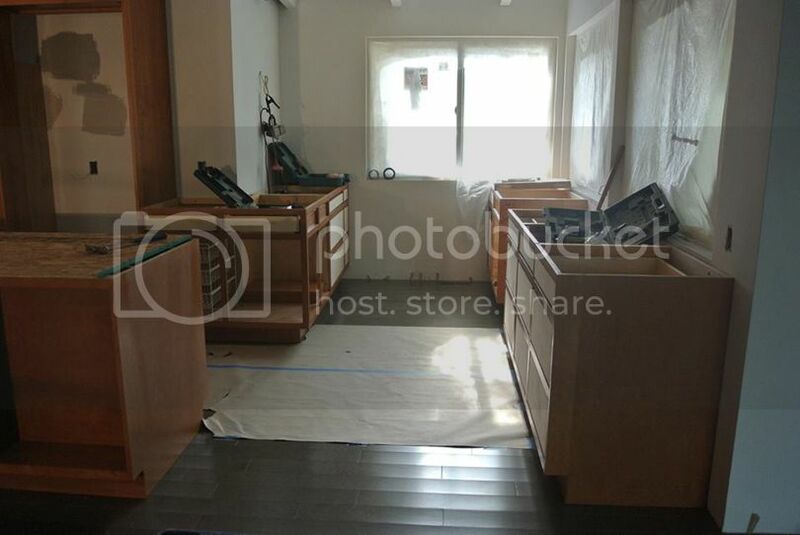 By Wednesday, they were in place and ready for counter top templates. WHOA! Although it seemed like it would NEVER get here, we finally are moving along in the kitchen area. We are still waiting on all of the doors & drawer fronts, and of course, haven't yet selected our hardware, but it's looking more and more like a house everyday! I was a bit nervous on the color of the wood, because it looks really orange in photos, but when I saw it in person, I knew it was perfect. The cabinets are birch and we stained them with a custom color blend from RepcoLite. Because we are putting faux wood laminate on the bathroom counters, we picked out the color we liked and had the stain match that. It was "Taj Teak" and I think RepcoLite did a great job! With the home being built in the 50's, I have to imagine this is what the original kitchen cabinet style would have looked; unfortunately when we bought it, we inherited a white laminate, 1990's version. Wah wah wah. While we've updated the layout to fit with our 2013 lifestyle, we wanted the style of the cabinets to reflect that of the house, not of 2013. This is the view from inside the front door. The kitchen is literally the center of the house. Some of the cabinet fronts are on already, but we're still waiting on a lot more! Let me try to explain what will eventually be here... You can see the pantry with the drawers that pull out (I think we are going to get at least one more drawer in here - seems like a lot of wasted space to me!) on the left. Then the IKEA wall oven & microwave (which we bought secondhand!) will go in the middle of the wall, and on the right there is a spot for our fridge (which we found on Craig's List!). At the end of the wall, before you turn the corner, I added three little floating shelves for everyday things like glasses, small bowls, and am reserving the top shelf for something cute, since I can't really reach it anyway. In front of the wall, you see the island. There are a couple of cabinet doors on already, but we're still missing a couple. 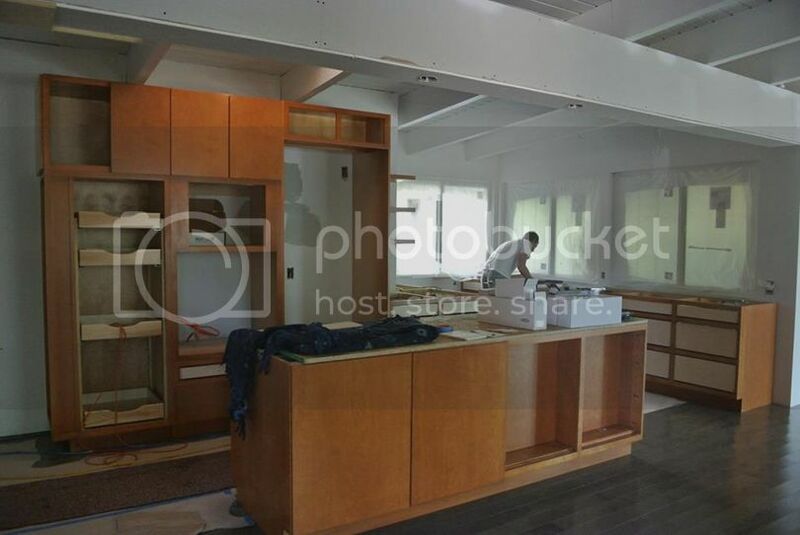 These doors on the back of the island will be sort of hidden under the counter top that hangs off the island to form the breakfast bar. They are very shallow cupboards that will store rarely used items such as wine glasses, etc. Here's the view from the living room. The photo of the left is from the first couple of days. 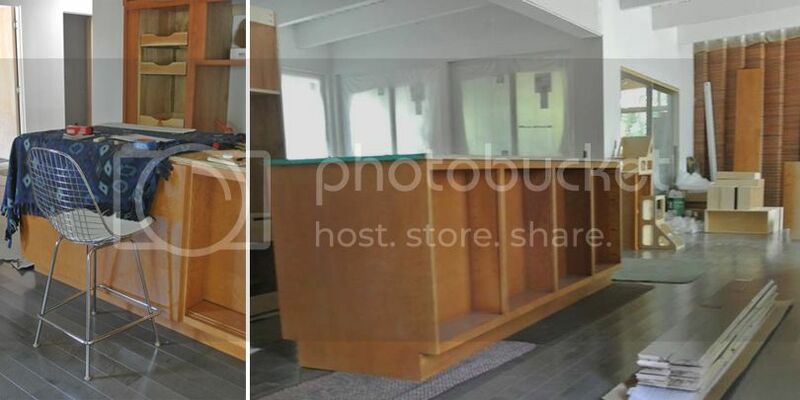 The photo on the right with Greg posing with the floating shelves in a couple of days newer. You can tell because we have a few more cabinet fronts on! Here is the spot where the former kitchen was. We didn't move any walls around in this area, just took down a partial wall and got rid of an office area to accommodate more kitchen. This should work very, very well for our family. We look forward to lots of party-hosting here! Greg got one of our bar stools out to see how much the counter should hang over to create a good size breakfast bar. He met the guy at the house this morning to determine that! I look forward to seeing what was decided. And there you have it - our kitchen "in progress"!